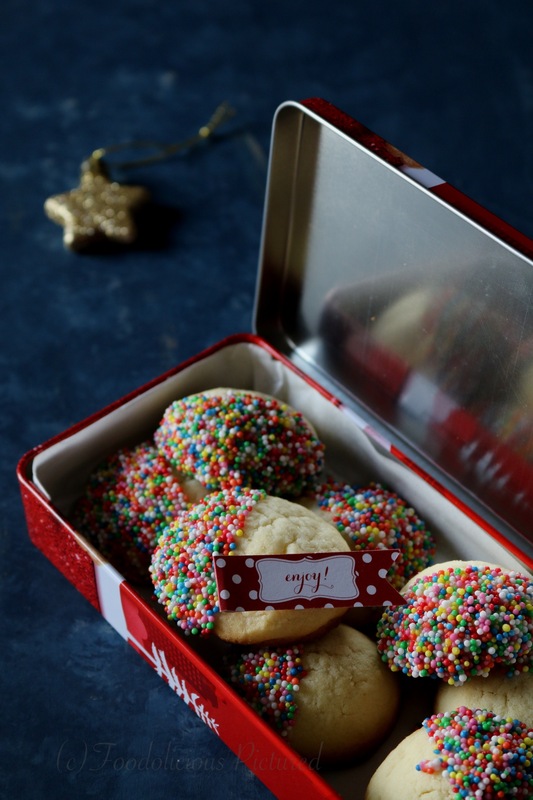 We are living up the Christmas spirit in sunny Singapore with some inspired baking – did a cake, some minty white chocolate barks for my girl’s class party, and these delicious butter cookies! I know simple is a relative term, but this is really simple to make. 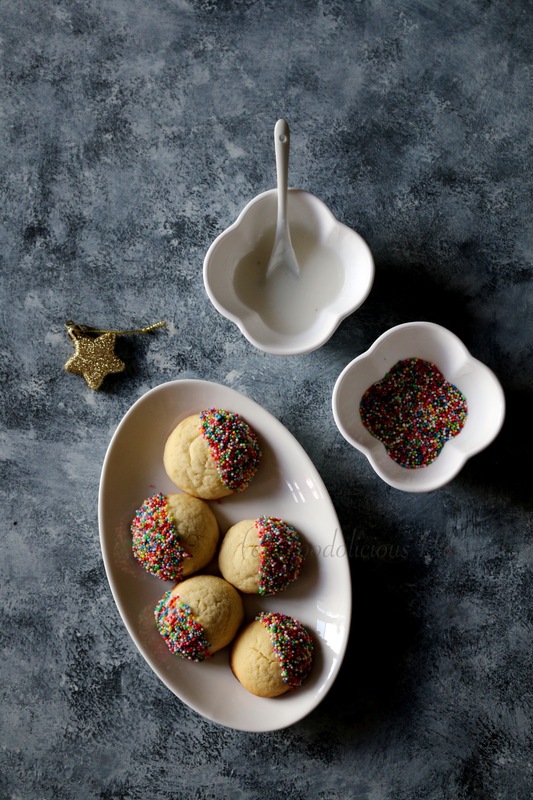 And those beautiful rainbow sprinkles add to the festive colors and add to the fun factor for kids! Pre-heat the oven to 180° C. Line a baking tray with parchment paper. Sift the flour, baking powder, salt and set aside. In a mixing bowl, beat the sugar and butter till pale and creamy. Add the egg and beat till combined. Add the essence. Gradually add the flour mixture and beat till everything is well combined. Refrigerate the dough for 30 minutes. Once the dough is firm enough to work; remove and shape into a walnut sized balls and place it on a prepared baking tray leaving a 2-inch space between each. Now bake for 15 minutes or till golden. Cool for about 5 minutes and then to wire rack to cool completely. 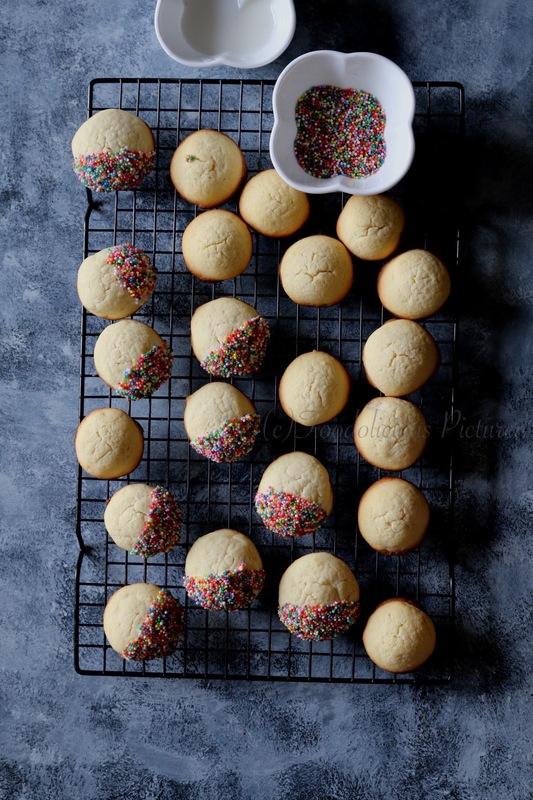 While the cookies are cooling, mix the lime juice, icing sugar and add enough water to make thick icing. Once the cookies are cooled. 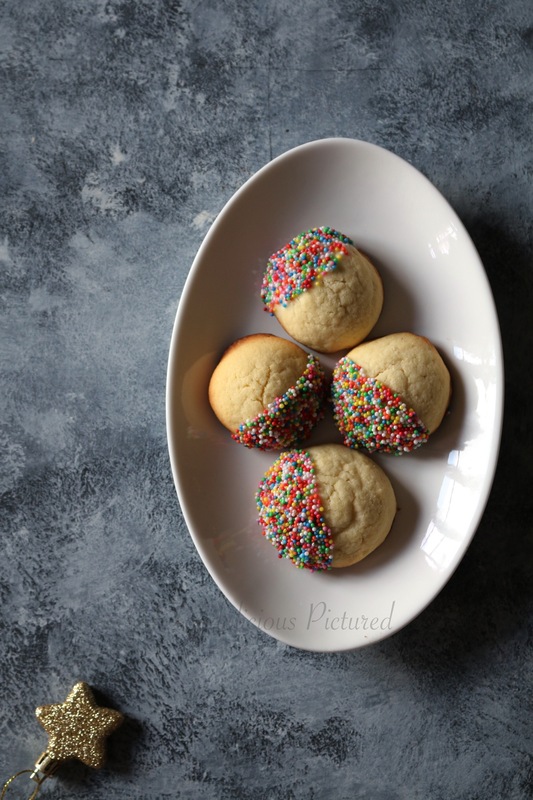 Dip half the cookie into the icing and into the sprinkles. Allow the cookies to dry on wire rack. Wow I have been thinking in the same lines.. rose flavored..love the look of this one. Lovely cookies. The rose water must add a lovely floral flavor to the buttery dough. Great job!